“In football you can always dream”. The words of Rotherham United chairman Tony Stewart. A man who has not yet failed to deliver a promise. A new state-of-the-art stadium, check. Championship football within five years? Well not quite. I suppose I’ll let him off considering in his first two years in the boardroom, Rotherham United were deducted a combined total of thirty-seven points and were still looking towards the top of the table rather than the bottom. Now the man with the freedom of the town has promised something even beyond the most optimistic of Miller’s dreams, the Premier League. Ambitious? Most defiantly, but brilliant? We’ll have to wait and see. Another famous line from the popular chairman is “It’s how you respond to adversity that ultimately determines how successful you will be”. You will not find a statement that describes Rotherham United’s two promotion campaigns more appropriately. Firstly in the 2012-13 season the Millers were on course to pick up a useful point at Morecambe after going down to 10 men mid-way through the second half, but right at the death former player Kevin Ellison headed home from close range to give Morecambe a 2-1 win. As a result, only five wins from their final five league games would realistically be sufficient for automatic promotion to League One. A feat they duly completed. The Millers won their remaining five games including a pivotal 2-0 win at bruising Capital-One Cup-finalists Bradford City. Fast forward roughly twelve months and the Millers were at Wembley and 2-0 down at half time to Russell Slade’s Leyton Orient in the League One play-off final. They fought back, of course they did. It was almost as if it was planned. Alex Revell scored two goals. One an incredible dipping volley from 35-yards out to force penalties and as a result left Steve Evans waking up a chicken the next morning. They even went behind in the shoot-out but still came back to win to spark wild celebrations in the East side of Wembley Stadium. The Millers had done it. The dream was a reality, they were back in the Championship once more. 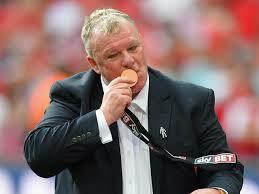 Steve Evans is not known for sitting back when it comes down to player recruitment. 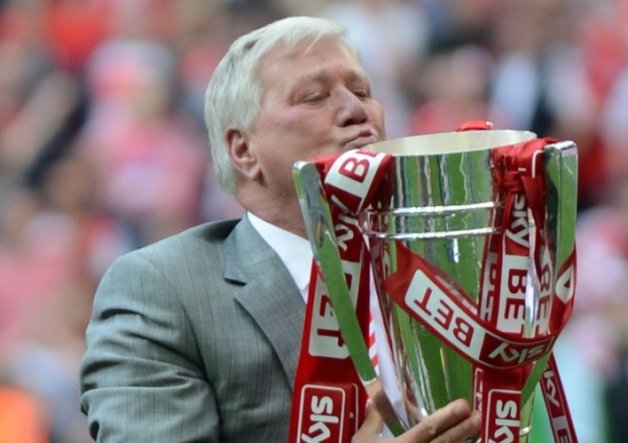 By the first week of July he had added eleven new faces to the New York Stadium. He went for a variety of players from different ends of the spectrum. Evans’ recruited Championship-experience through the likes of former Olympiakos striker Matt Derbyshire, ex-Derby County and Leeds United midfielder Paul Green and full-back Frazer Richardson a ‘local lad’ who enjoyed successive promotions with Southampton. Next on Evans’ agenda was youth and again he delivered, splashing out £250,000 to make Jordan Bowery the club’s record-signing and also acquiring the services of Conor Newton on a free transfer from Newcastle United. The energetic box-to-box midfielder had enjoyed two impressive loan spells at St. Mirren and his fine form was rumoured to be interesting Championship rivals Birmingham City, Wolverhampton Wanderers and Millwall. Finally the Miller’s manager went for players with a point to prove in the form of Fabian Brandy and Ryan Hall who signed on free transfers from Sheffield United and Leeds United respectively. These two have lost their way a little in recent times, but Evans has proven to be successful at getting the best out of players who still have much more to give. Take Ben Pringle for example, a man once described as a “five-a-side player” by previous manager Andy Scott (good riddance). Evans on the other hand discovered Ben Pringle has an exceptional left foot and an exquisite crossing ability, he worked with him and alas he played an instrumental role in two promotion campaigns. Kieran Agard another. A fairly modest goal-scoring record when he joined the club but Evans turned him into a goal-machine, Agard scored 26 goals last term, the best of his career; and now has received reported interest from Championship giants Leeds United. Evans insists however he’s going no where. The Millers still don’t seem to be finished in the transfer market. Swindon Town recently reported that they had rejected a six-figure bid for midfielder Massimo Luongo and there are rumblings that the Championship newcomers are still interested in Scottish Under-21 international Stevie May and with contract talk currently on hold with the St. Johnstone striker, I wouldn’t bet against Steve Evans lodging another bid to take him to the New York Stadium. Quite a few players have left the New York Stadium during the Summer. Nicky Adams joined Bury for an undisclosed fee before the season had even finished, while Danny Hylton was allowed to join League 2 promotion-hopefuls Oxford United on a free transfer. Members of both the previous promotion squads departed as Scott Shearer, Claude Davis and fans’-favourite Michael O’connor were allowed to head for pastures new. Wes Thomas, who scored the equaliser in the play-off semi-final against Preston North End; snubbed a contract extension, opting to sign for Championship-rivals Birmingham City on a two-year deal. They also missed out on lively full-back James Tavernier. Despite agreeing a fee with his parent-club Newcaslte United he opted to join Uwe Rosler at FA Cup semi-finalists Wigan Athletic instead. It still remains unclear if the club have any interest in bringing Tavernier’s ex-team mate and former loanee Haris Vuckic back to the New York Stadium. The Slovenian appeared mainly from the bench but still showed glimpses of his ability including a brace in Rotherham United’s 6-0 thrashing of Notts County. After his release by Queens Park Rangers, the Millers offered a deal to young striker Tom Hitchcock after he impressed at the New York Stadium whilst on loan most notably with a stunning thirty-minute hat-trick against Gillingham. The striker opted for more game time and signed for the MK Dons after being used largely as a substitute whilst with the Millers, a great shame. I rate Hitchcock very highly after his spell with the club and wouldn’t be surprised to see him scoring on a regular basis at Stadium MK next season. I respect any player that puts playing football ahead of anything else so therefore I wish him luck. Finally it appears that midfielder Richard Smallwood will not be returning to the club he helped get into this division after he too had a successful loan spell. Middlesbrough rejected an offer recently from the Millers for the holding midfielder and remain determined to keep him at the Riverside. Steve Evans doesn’t win many popularity contests (outside of Rotherham of course), but what the fiery Scott does win is football matches and lots of them. The former-Crawley Town chief has a 50% win ratio with the Millers and in case you forgot, he also has two promotions with the South-Yorkshire club. Evans is a born winner. The stats don’t lie and they say in the past four seasons, the Scott has been involved in four successful promotion campaigns (two with Crawley Town and two with Rotherham United). Evans builds his teams around hard work and if he senses a player is not giving 100% week in week out he shows them the door and most recently, the way to Bury. He doesn’t tolerate bad attitude or as he puts it “bad apples” disrupting the dressing room. An approach that has certainly worked over the years. So says Steve Evans and he doesn’t proclaim this lightly. Last season the Millers gained an extra fifteen points in the last five-minutes of games, more than any other side.Unity, a will to win and no fear are qualities needed by any side who are making the step up to the Championship where the competition is so strong. Team-spirit can only get you so-far, you have to have ability to be successful and this side has it in abundance. Between the sticks they have Adam Collin and former England u21 international Scott Loach competing for the number 1’s spot. They have talent in the middle of the park with the vastly experienced Paul Green and energetic box-to-box midfielder Lee Frecklington and defensive solidity with Craig Morgan marshalling the back line. What they also have is Ben Pringle’s left foot. You wont find many better in the division. His crossing ability is exceptional and if he sees a player in the box he’ll more often than not put the ball on a plate for them. Alex Revell is a man who epitomizes everything Rotherham United have been about over the last few years. Grit, determination and hard-work. He’ll run himself into the ground until he’s got nothing left to give, he has a heart as big as a lion and is a valuable asset. In Kieran Agard the Millers also have a tallies-man. After netting 21 goals in League One last season he’s proven he can score goals on a consistent basis, if he can find his form in the Championship he could once again prove instrumental to the club’s season. Matt Derbyshire is another who could have a big impact. The striker enjoyed a purple-patch at the end of last season for Nottingham Forest scoring five goals in as many games. With the quality in the Rotherham United side the 28-year old will get chances to score. It’s up to him to deliver the goods. The Championship is a tough and unforgiving league. The differences between the clubs at the top and the bottom end of the financial scale is colossal. I often makes this comparison. Cardiff City received up to £60 million for relegation (in parachute payments) to the Championship, where as Rotherham United received £4 million for their promotion to the division. That isn’t a complaint, more of a reality check. History however is on their side. In the last 10 years only one of the previous seasons’ play-off winners have been instantly relegated (Yeovil Town 2013-14). This season is all about survival for the Millers yet admirably the club are still aiming high and daring to dream. The will and desire to fight until the end for every lose ball and every set piece suggests that the Millers wont provide anybody with an easy game and teams will know they’ve been in a battle after they’ve played them. I believe this squad has the quality to compete and ultimately survive in the Championship and I predict an 18th placed finish which would be yet another fantastic achievement for a club that just six years ago was on the brink of extinction. The first game of the season takes the Millers to Pride Park to face beaten play-off finalists Derby County, this makes a change from an opening day clash at the Don Valley Stadium at “home” to Accrington Stanley. I for one am keenly anticipating the 2014/15 season and looking forward to the Championship.